In this edition of Research Connections, find links to researchers in the news, updates on important deadlines, and more news for University of Rochester researchers. David Auerbach, senior instructor in medicine, says his KL2 award has "opened many doors for me." David Auerbach's interest in pursuing a scientific career began during a hockey game his first year of college, when a teammate — who turned out to be a chief medical examiner — asked Auerbach if he would like to observe a case. Now Auerbach's career is taking a major step forward with a two-year KL2 Mentored Career Development Program award from the University's Clinical and Translational Science Institute. "It has opened up many doors for me," says Auerbach, including lead authorship of a recent paper in Neurology. 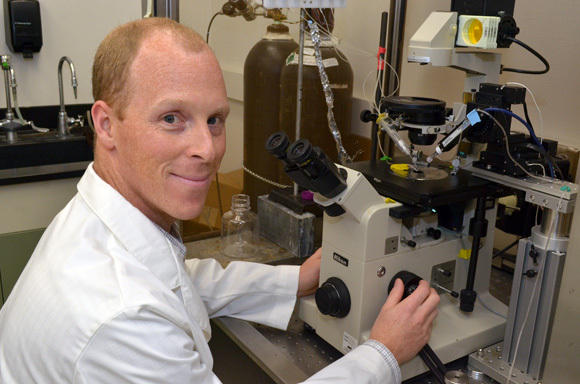 Auerbach, a senior instructor in the Department of Medicine/Aab Cardiovascular Research Institute, is taking a multisystem approach to understanding the mechanisms that cause electrical disturbances in both the hearts and brains of patients with genetic ion channel diseases. Ion channels, located in the plasma membrane of cells, are narrow tunnels that open and close at precise times to allow the flow of ions into or out of the cell, thus shaping the electrical activity in the heart and brain. As a postdoc working with Lori Isom, a professor at the University of Michigan, Auerbach demonstrated that people with severe genetic forms of epilepsy were at a higher risk not only of electrical disturbances in the brain, resulting in seizures, but also of electrical disturbances in the heart, causing arrhythmias. In order to establish an independent line of research, Auerbach decided to approach the problem in reverse: are people with long QT syndrome — a classically studied genetic cardiac disease that causes arrhythmias — also at an increased risk of seizures? He came to Rochester in 2014 specifically because of its research strengths in this area, including the opportunity to work with such experts as Arthur Moss, the Bradford Berk Distinguished Professor of Medicine; Robert Dirksen, the Lewis Pratt Ross Professor and chair of pharmacology and physiology; and Charles Lowenstein, chief of cardiology and director of the Aab Cardiovascular Research Institute. The KL2 award is enabling him to take full advantage of those opportunities. "As an undergraduate and graduate student, your training is very formalized: you are told 'these are the courses you need to take; these are the expectations you must meet.' Even as a postdoc, you need strong mentorship and help in guiding your research progress," Auerbach says. "But eventually you need to start developing your independent research direction. However, you don't want to just jump out into the middle of this body of water without any direction." "Just writing the KL2 application forced me to really think about what are the critical pieces of my career development," Auerbach said. 1. A strong mentoring team whose members bring diverse areas of expertise that are well suited to the "multisystem" approach Auerbach is pursuing. The members include Moss, a renowned expert on cardiac arrhythmias and the genetics of heart disease; Dirksen, who specializes in the mechanisms of muscle diseases; Lowenstein, whose clinical interests include cardiac patients with acute coronary syndromes; and Robert Gross, professor of neurology, whose interests have centered on aspects of cellular neuropharmacology. 2. An individually designed training program of courses, seminars, and workshops to help Auerbach become well rounded. Trained in basic science, he is broadening his clinical knowledge with classes in database management and analysis, for example. Because his prior research was primarily focused on cardiac disturbances, he has taken EEG seminars to better understand neuronal symptoms. 3. An opportunity to develop preliminary data, using Moss's Long QT Patient Registry and an animal model of the disorder. This has resulted in one NIH grant, an invitation to apply for another, the paper in Neurology and another in preparation. All of this has "created an ideal environment," Auerbach says, toward reaching his next goal: Securing a tenure track faculty position at the Medical Center. He is excited about the associations he is establishing between long QT syndrome, a classically studied heart disorder, and seizures resulting from electrical disturbances in the brain. "We need to take the blinders off. We need to look not just at the classic organ of study, but the multisystem manifestations of the disease," Auerbach said. He recently demonstrated that patients with long QT syndrome are also at an increased risk of seizures. Due to the great breadth of information in the Long QT Syndrome Registry, he was even able to tease out differences in the risk of seizures based upon the type of long QT syndrome and the region of the mutation in the protein structure. "I've shown an association between long QT syndrome and seizures; now we need to understand the mechanisms underlying this, in order to really understand why these people are at an increased risk of both neural and cardiac diseases." The research plan in his CTSI-KL2 grant outlines a translational approach that will help him further his studies in that direction, including further epidemiological analyses, plus mechanistic cellular/animal studies. The CTSI Career Development Program (KL2 Scholars Program) in Clinical and Translational Research is a two-year program designed to support the early career development of multidisciplinary scientists. The goal of the program is to promote the successful transition of KL2 scholars to an independent career as a clinical and translational investigator, generally by means of an individual K- or R-award. Click here to read the full RFA. Email Katie Libby by 5 p.m. Monday, Oct. 10, 2016, if you intend to apply. Full applications are due Nov. 11. Do you have an interesting photo or other image that helps illustrate your research? We would like to showcase it. Send a high resolution jpg or other version, along with a description of what it shows, to Bob Marcotte . Experiments using the OMEGA laser at the University's Laboratory for Laser Energetics (LLE) have created the conditions capable of producing a fusion yield that's five times higher than the current record laser-fusion energy yield, as long as the relative conditions produced at LLE are reproduced and scaled up at the National Ignition Facility (NIF) at Lawrence Livermore National Laboratory in California. The findings are the result of multiple experiments conducted by LLE scientists Sean Regan, Valeri Goncharov, and collaborators, whose paper was published in Physical Review Letters. Arijit Bose, a doctoral student in physics at Rochester working with Riccardo Betti, the Robert L. McCrory Professor at LLE and director of the Fusion Science Center, interpreted those findings in a paper published as Rapid Communications in the journal Physical Review E (R). Bose reports that the conditions at LLE would produce over 100 kilojoules (kJ) of fusion energy if replicated on the NIF. While that may seem like a tiny flicker in the world's ever-expanding demand for energy, the new work represents an important advance in a long-standing national research initiative to develop fusion as an energy source. The 100 kJ is the energy output of a 100-watt light for about 20 minutes, but in a fusion experiment at NIF, that energy would be released in less than a billionth of a second and enough to bring the fuel a step closer to the ignition conditions. "We have compressed thermonuclear fuel to about half the pressure required to ignite it. This is the result of a team effort involving many LLE scientists and engineers," said Regan, the leader of the LLE experimental group. If ignited, thermonuclear fuel would unleash copious amounts of fusion energy, much greater than the input energy to the fuel. Read more here. Researchers at the University of Rochester have moved beyond the theoretical in demonstrating that an unbreakable encrypted message can be sent with a key that's far shorter than the message — the first time that has ever been done. The findings by Daniel Lum, a graduate student in physics, and John Howell, a professor of physics, have been published in the journal Physical Review A.
Lum and his team developed a device — a quantum enigma machine — that would put quantum data locking into practice. Quantum data locking, a method of encryption first advanced by Seth Lloyd, a professor of quantum information at Massachusetts Institute of Technology, uses photons — the smallest particles associated with light — to carry a message. Lloyd's system remained theoretical until this year, when Lum and his team developed their device, which takes its name from the encryption machine used by Germany during World War II, which employed a coding method that the British and Polish intelligence agencies were secretly able to crack. "While our device is not 100 percent secure, due to photon loss," said Lum, "it does show that data locking in message encryption is far more than a theory." Read more here. 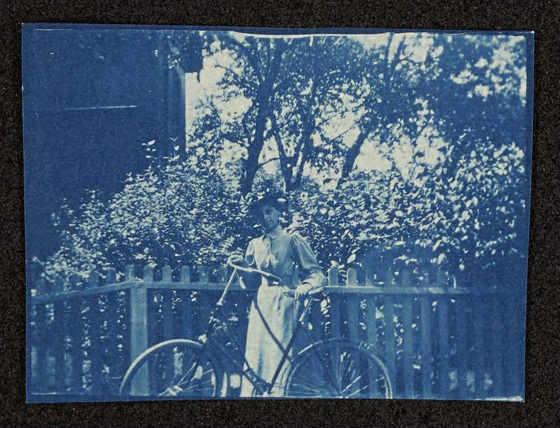 May Bragdon and her bicycle "Diana" in August 1895. "Let me tell you what I think of bicycling. I think it has done more to emancipate women than anything else in the world." — Susan B. Anthony. May Bragdon was a single woman of modest means, executive secretary to Rochester architect and mail chute inventor J. G. Cutler, and later the office manager for her brother Claude's architectural practice. She was also a bicycle "fiend." And so were many of her friends. In her diaries, May writes about "flying freely down a hill" on the bicycle she named Diana. She describes waking up at 6 a.m. and cycling eight miles before work — not something we usually associate with women of the 1890s. And she makes a special note of it whenever she decides — heaven forbid — to ride without a hat on. "She's in this transitional period where it's new and somewhat daring for a woman to be out riding alone, or in the company of men to whom she is not related by blood or marriage," says Andrea Reithmayr, the editor of the five-year University Libraries project that transcribed, annotated and put the diaries online. "In the diaries, you can see how May and her friends are constantly negotiating change — pushing their personal envelopes toward new experiences." Reithmayr sees many opportunities for class projects in the diaries. For example, May often describes the exact routes she followed in and around Rochester on her bicycle, on streetcars, trains, and ferries. Using GIS, Reithmayr says, students could use period and modern maps to plot those routes, thereby visualizing and analyzing the change and growth of Rochester and its suburbs and its system of public transportation. For example, by 1900, Monroe County had one of the nation's best systems of bike paths: where does it stand today? Bragdon was not politically active, and not one to make sweeping social and cultural observations in her diaries. Nonetheless, many of the personal anecdotes she shares reflect social and cultural themes that will be of interest to academic researchers and average readers alike. Visual and cultural studies. "May records the books she and her friends read, the plays they attended several times a week, the word games they played and the costume parties they had," Reithmayr says. The diaries are "peppered" with theater programs that, in and of themselves, are a valuable resource. The thousands of photographs provide ample evidence of the impact of "the Kodak" — the personal camera that revolutionized how people looked at and documented the world and themselves. "The New Woman." In addition to cycling unescorted, May and her female friends often travelled alone and vacationed in the Adirondacks, Maine, or Georgian Bay, "climbing up mountains, rowing across stormy bays," Reithmayr says. "We don't usually think about women at this time camping in their 20 pounds of clothing, but there they are, and not complaining about it." Together with details of daily domestic, work, and recreational life, and stories of marriage and childbirth, these documents are "living history." Rochester history. "Pretty much every political and social event that occurred in the city from 1893 to 1914 is in the diaries," Reithmayr says. For example, May offers accounts of the 1901 Rochester Orphan Asylum fire, the 1904 Sibley fire, floods, elections, and, yes, cat shows. She also includes references to the Chicago World's Fair and the Pan-American Exposition. Three teams of University researchers are collaborating with Carestream Health Inc. on developing new technologies to expand the use of ultrasound imaging for medical diagnosis. 1. Diagnosing tendon damage, led by Stephen McAleavey with Mark Buckley of the Department of Biomedical Engineering. Initially the project will focus on insertional Achilles tendinopathy, a painful heel condition that resists nonsurgical treatments. 2. Characterizing the structure of aortic abdominal aneurisms and blockages in carotid arteries, to more accurately assess the risk of ruptures, led by Michael Richards of the Department of Surgery with Marvin Doyley of the Department of Electrical and Computer Engineering. 3. Producing handheld devices, using novel system architectures and relatively inexpensive components, led by Zeljko Ignjatovic, with Michael Huang and Doyley, all of the Department of Electrical and Computer Engineering. Diane Dalecki, director of the Rochester Center for Biomedical Ultrasound and chair of the Department of Biomedical Engineering, said, "this is a dream match between a company in our own backyard and our researchers, who are eager to take the work they're doing in the laboratory and translate it to people who are building the products that make a difference for patients and physicians." Carestream Health, a leader in medical and dental imaging, entered the ultrasound market earlier this year, and is looking to expand its portfolio of products. Read more here. A $2.3 million Department of Defense grant will help neuroscientists develop new treatments for the emergency room and the battlefield — focusing on the development of new therapies that could help protect brain and other at risk organs following a trauma, heart attack, or stroke. "While we have made significant progress in our ability to restore blood flow after stroke or cardiac arrest, the medical community does not have drugs at its disposal to prevent the secondary damage that occurs after these events," said Marc Halterman, associate professor of neurology and the principal investigator of the study. "This grant will further our research on a promising class of drugs that possess both anti-inflammatory and cytoprotective properties that we believe will be suitable for use in both military and emergency conditions." The project was developed in collaboration with a team of synthetic antibiotic chemists in Salt Lake City, led by Mark Nelson, who will serve as the principal investigator for the sub-award to Echelon Biosciences. Read more here. Peter Christensen, assistant professor of art history, will be able to use images like this one in his forthcoming book Germany and the Ottoman Railways: Art, Empire, and Infrastructure (Yale University Press, 2017) with the help of a SAH/Mellon Author Award from the Society of Architectural Historians. The award helps defray the high cost of image acquisitions for scholarly monographs on the history of the built environment. Christensen's book shows how the late 19th-early 20th century German-designed train stations, bridges, and other structures along the Ottoman Railway from Bosnia to Baghdad bear not only the trademarks of imperialism, but also incorporate elements of emergent nationalism. "In an increasingly challenging publishing environment, it is a real honor to receive this support from the Society of Architectural Historians and the Mellon Foundation for art historical scholarship, which often requires the production of large amounts of images and figures," Christensen says. "With this support, I will be able to provide the full range of visual evidence of my argument." Thomas Fleischman has joined the Department of History as an assistant professor. Environmental history, the history of state socialism, economic history, the history of modern Germany, and the history of animals all intersect in Fleischman's work. His forthcoming book, Three Little Pigs: East Germany's 'Green' Revolution, 1945-2000, focuses on East Germany's decision in the 1970s to develop a large-scale pork industry, which culminated in an environmental disaster. Fleischman argues that practices of industrial agriculture in state socialist and capitalist economies were very similar and led to parallel environmental problems. He joins the faculty after postdoctoral appointments in Yale University's Agrarian Studies Program, as visiting assistant professor at Bowdoin College, and as writer-in-residence at New York University's Jordan Center for the Study of Russia. Banu Kandemir, Chemistry, "Electrocatalytic Hydrogen Evolution from Water by Biomolecular Cobalt Catalysts." 2 p.m., Sept. 13, 2016. 108 Goergen Hall. Advisor: Kara Bren. Sarah Bibyk, Brain & Cognitive Sciences, "A Rise by Any Other Name: An Investigation of the Production and Comprehension of Rising (and Falling) Intonation in Questions." 10 a.m., Sept. 15, 2016. 269 Meliora Hall. Advisors: Michael Tanenhaus and Gregory Carlson. Jill Caputo, Chemistry, "I. Nickel-Catalyzed Additions to Imines and Aldehydes and 2. Photoredox Catalysis with Quantum Dot Catalysts in Carbon-Carbon Bond Forming Reactions." 1 p.m., Sept. 15, 2016. 109 Georgen. Advisor: Daniel Weix. 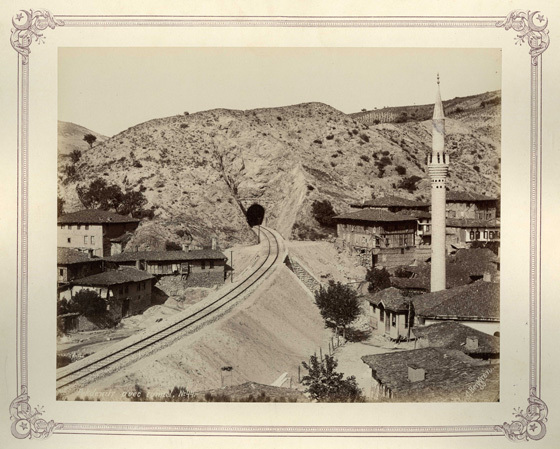 Sept. 15: Work in Progress Seminar: Ambiguities of Empire: Architecture and the German Construction of the Ottoman Railway Network, with Peter Christensen, assistant professor of art history. Noon to 2 p.m., Gamble Room, Rush Rhees Library. Open to the University community. Sept. 16: CIRC symposium. Ignacio Franco from the Department of Chemistry will discuss simulations of the Stark control of electrons along nanojunctions. Alex Aiezza from the Aab Cardiovascular Research Institute will discuss secondary analysis of high-throughput sequencing data. 11:30 a.m. to 1 p.m., Goergen 108. Sept. 22-24: Department of Neurology 50th anniversary celebration, including gala banquet, department updates, and poster and platform presentations showcasing research by current faculty, alumni, fellows, and residents. Read more here. Sept. 26: 5 p.m. deadline to submit initial abstracts for pilot awards from the Clinical and Translational Science Institute in three categories: Incubator Program, investigator-initiated and UNYTE, and novel biostatistical and epidemiologic methods. Sept. 26-28: MEDTECH2016 Conference on Innovation Impact: Keeping New York's Finger on the Pulse. Join executives and senior leaders from New York State's bio/med industry who will focus on the need to re-think the way players interact in the healthcare market — from development through adoption — leveraging the strengths of nontraditional partnerships to produce groundbreaking results. Hilton Albany, 40 Lodge St., Albany, New York. Read more here. Sept. 29: Identifiying journals for publication; avoiding predatory publishers. Noon to 1 p.m., Miner Classroom 1. Sign up here. Sept. 30: "Community and Research Partnering to End the Epidemic," the 2016 Center for AIDS Research Scientific Symposium, 8 a.m. to noon, Class of '62 Auditorium. Click here for more information. Oct. 10: 5 p.m. deadline to indicate intent to apply for the CTSI Career Development Program (KL2 Scholars Program). Email Katie Libby. Click here for the full RFA. Full applications are due Nov. 11. Oct. 11-13 "Symposium on Maladaptive Behaviors: Why We Make Bad Choices." Memorial Art Gallery. Keynote speaker: Trevor Robbins, head of pscyhology at Cambridge University. More than two dozen distinguished U.S. and international experts. Sponsored by the School of Medicine, the Ernest J. Del Monte Institute for Neuroscience, and the Silvio O. Conte Center. Click here to learn more. Oct. 21: 5 p.m. deadline to apply for Program of Excellence Awards of up to $50,000 each from Center for AIDS Research, for collaborative projects involving co-PIs from the School of Nursing and from the School of Medicine and Dentistry. Click here for the full pilot announcement. Nov. 1: Deadline to apply for a CTSI Population Health Research Postdoctoral Fellowship. Click here for more information and application instructions. Please send suggestions and comments to Bob Marcotte. You can see back issues of Research Connections, an index of people and departments linked to those issues, and a chronological listing of PhD dissertation defenses since April 2014, by discipline. Rochester Connections is a weekly e-newsletter all faculty, scientists, post docs and graduate students engaged in research at the University of Rochester. You are receiving this e-newsletter because you are a member of the Rochester community with an interest in research topics.